What is a Head Flag? It's the PERFECT GIFT. 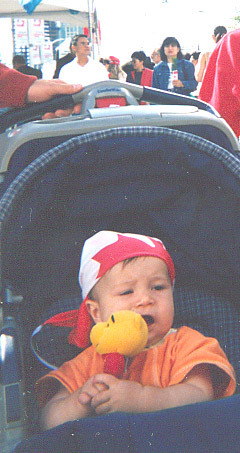 A Head Flag is a bandanna with a flag motif. It includes a 6 inch cord sewn to the top left corner and another 6 inch cord sewn to the bottom left corner. These cords allow you to easily tie the bandanna to anything you choose. 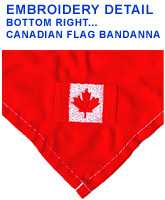 Head flag bandannas also include embroidery on the bottom right corner which when folded, is positioned front and center on your forehead (see folding directions option B and photo on right). "I'm originally from Trinidad, but I have been in Canada since I was little. 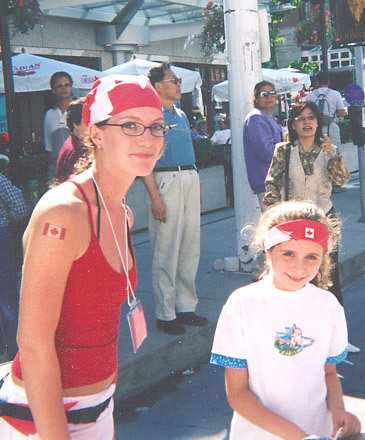 I used my Canadian Flag Bandana as a belt around my waist. Vive le Canada!" Watching your favourite international sporting event? 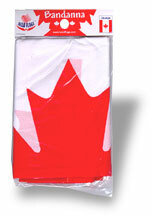 Take off your head flag bandanna and wave it around to show your support for Canada. Exercising? Head flag bandannas make excellent sweat bands. Traveling overseas? Do you want to meet people? 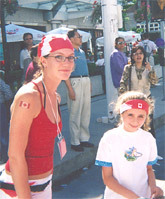 Use your head flag bandanna to identify yourself as Canadian. Do you want to feel like superman? Tie the strings loosely around your neck and wear the head flag bandanna as a cape. Need to clean your glasses? In a medical emergency you can use the head flag bandanna as a bandage or sling. Head flag bandannas make excellent bikini top or bottom covers. Sorry guys! Having a picnic? Use your head flag bandanna as a picnic blanket. Allergies? Need a handkerchief? How about a head flag bandanna? Need sun screen? 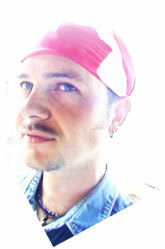 Put your bandanna on and protect that precious skin of yours. "Wrap your Canadian Flag Bandanna around your mouth as a mask if you're near a smelly farm." "I am from Vancouver orginally. I work in the States now and everyone seems to make fun of Canada. I wear mine to work to tell all those jokers, 'S###w You! Canada Rocks!' Great Product!" 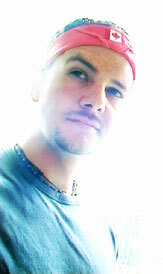 2002 � Copyright, Head Flags. All Rights Reserved.